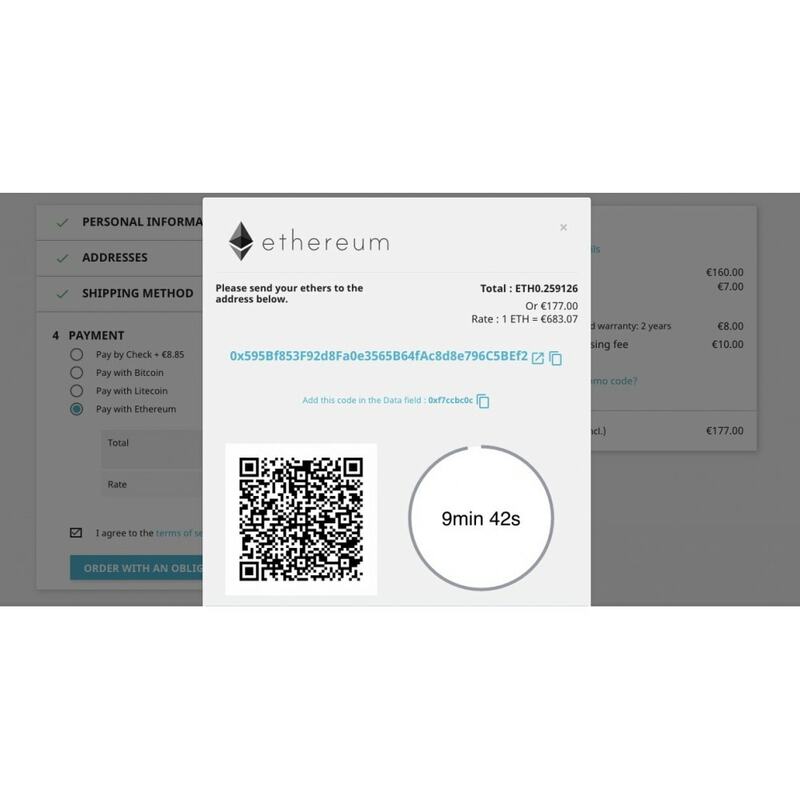 Ethereum payment module for PrestaShop allows you to accept ethers directly into your Ethereum wallet (Ledger, MyEtherWallet, Coinbase, Mist, Exodus, MetaMask, Trezor, ...). Offer your customers simple and secure Ethereum payment. Accept ethers directly to your Ethereum wallet. No need to pass through a tier for ethers payment processing. You save the fees and commissions charged by third parties. Check the ethereum blockchain payments for orders saved. 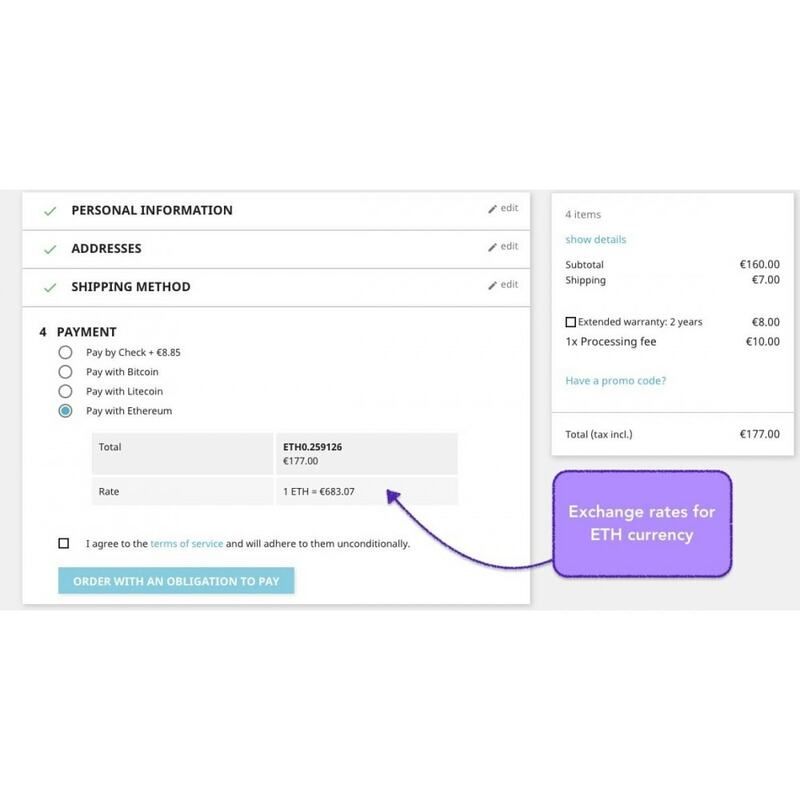 In your Back Office, an order status lets you know orders paid in ether. The module manage transparently the ETH currency. The exchange rate of ETH currency is updated automatically. Define easily the exchange rate calculation : Weighted Average, Real Time or Most profitable. Apply an extra fee or reduction to exchange rate for payments in Ether (Example: if you set -5%, the module will apply a reduction of 5% to the total price in bitcoins). Works with famous Ethereum wallets (Ledger, MyEtherWallet, Coinbase, Mist, Exodus, MetaMask, Trezor, ...).